Ms. Cara Carleton Sneed (AKA Carly) single-handedly destroyed the decades-long positive culture and business model at HP (not unlike what her little friend Meg did at eBay). She is a greedy, vindictive character who will lie through her teeth just for the heck of it. She couldn’t even keep her Sarah Palin stories straight while working for McCain’s campaign. As Jack Davis said in your story today, I pity this poor state and the rest of the country if this “cad” should somehow manage to get elected senator. Not to shed any tears for Prince Gavin, but oh the joys of San Francisco politics. 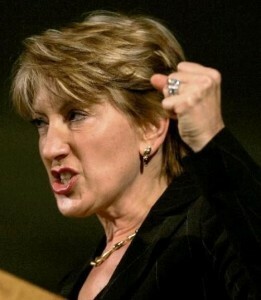 “Carly of Arabia!” Very nice reference on this eighth anniversary of 9/11. >Carly of Arabia: Here at Calbuzz, our Department of Erudition’s Division of Bibliographic Resources and Recreational Imbibing maintains one of the world’s most extensive databases of news and information sources. Calbuzz knows Iranians aren’t Arabs. Calbuzz also has a sense of humor which, apparently, this reader does not. Not at all. It was a most amusing jest. Those definitely work … Prince of Persia is a famous game, if not a famous movie.